One of the joys of mirrorless interchangeable lens cameras is the ability to experiment with older lenses, bellows, and similar equipment without any tedious record keeping or expense of film. 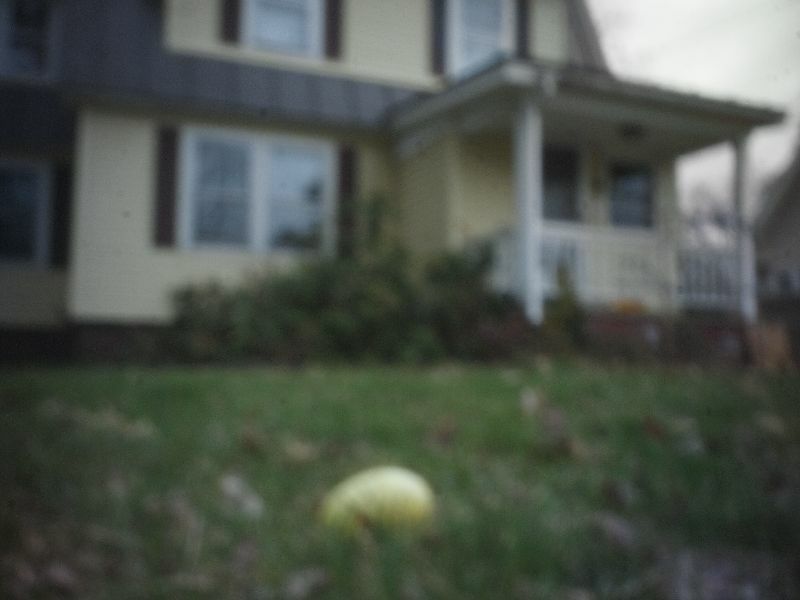 With a simple attachment, one can readily adapt a mirrorless camera to experiment with one of the earliest photographic techniques, using a pinhole rather than a lens to project the image. 1. 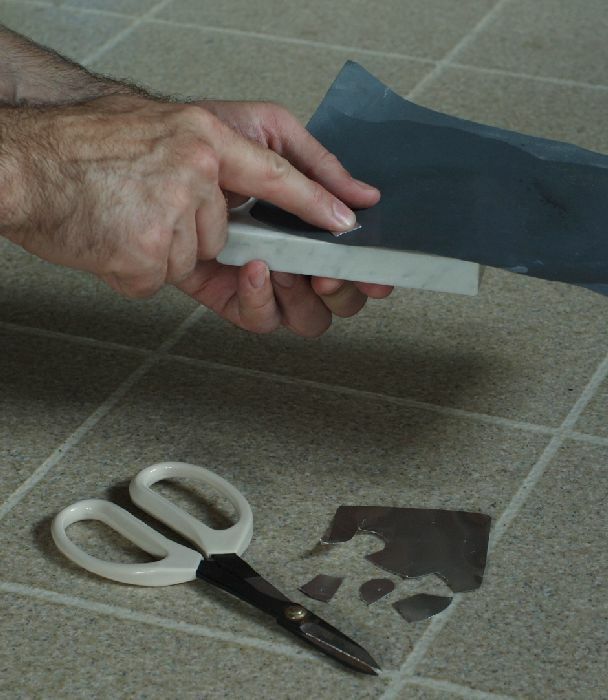 Use the inner edge of the washer to trace circles onto the aluminum sheet. Then, use the C-mount adapter to trace a larger circles around the smaller circles; these circles should be spaced in slightly from the inner edge of the opening in the C-mount adapter. Cut out the circles. 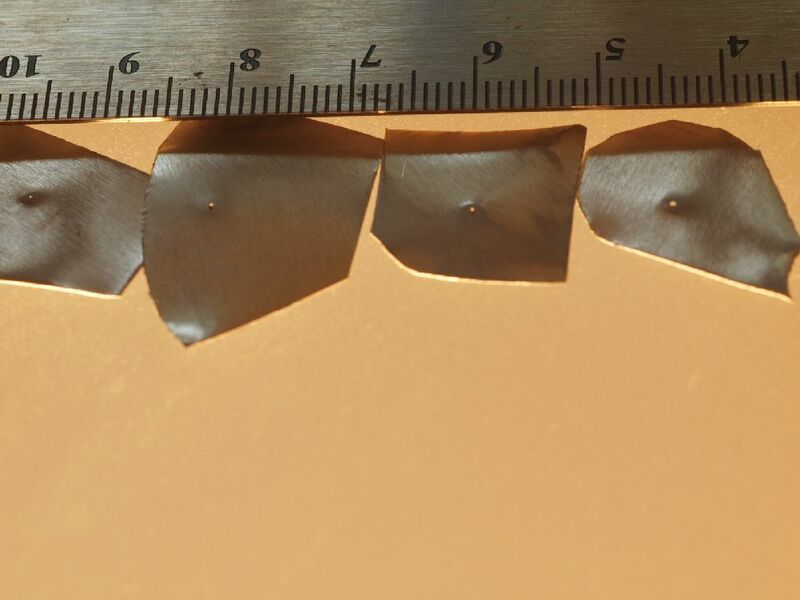 Note that the metal edges may be sharp enough to cut through skin! 4. 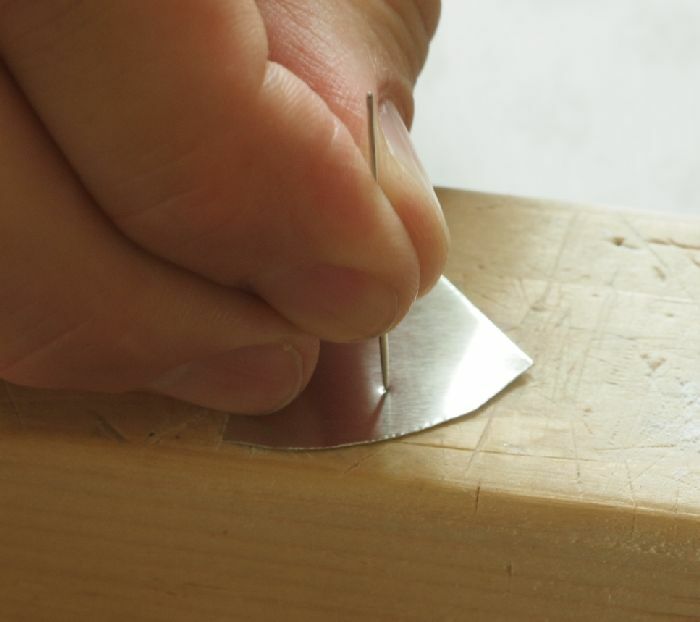 Use the needle to poke a small hole in the center of each indent to form aperture disks. Ideally, the hole should be 0.2mm in diameter for a Four Thirds sized sensor. Since the ruler likely is not marked finer than millimeters, estimate about 1/5. The first try, most likely the smallest hole will still be overly large. No, I don’t really believe that readers really need this step illustrated. Yes, I should have trimmed my nails. 5. Select the best-looking of the punched disks and use CA adhesive to attach it onto the washer, with the punched hole centered in the washer opening. 6. Optionally, spray the washer and disk (on the side of the washer onto which the disk is attached) flat black. 7. Position the washer in the recess in the C-mount adapter (with the aperture disk facing inwards toward the camera-mounting side) and move it until the aperture is centered. 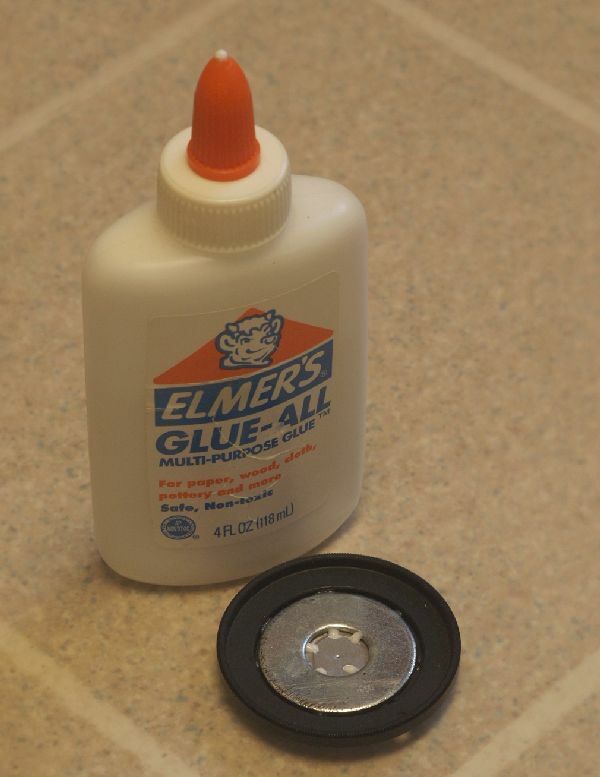 Use dots of PVA glue around the washer (applied on the outer lens-mounting side of the adapter) to attach the washer in position, and set aside to let the glue cure. Testing of the Mark I suggested that the aperture was too large, resulting in a blurry image. indicates that, for a Four Thirds sensor (17mm x 13mm), the optimal size would be 0.2mm. Comparing the aperture to a ruler revealed in an estimated 0.4 mm aperture, rather than the optimal 0.2 mm. Naively believing that a sharper image could be attained with the proper aperture size, the MkI device was modified. 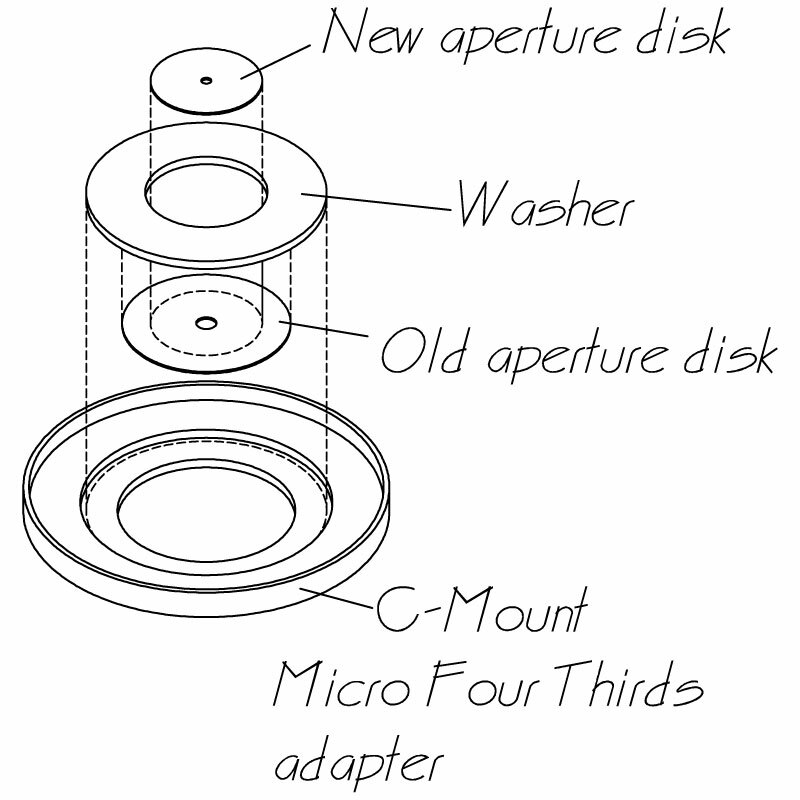 To provide a smaller aperture, and the ability to readily change the aperture disk as needed, the aperture of the Mark I device was drilled out a bit and a new aperture disk added to form the Mark II device. 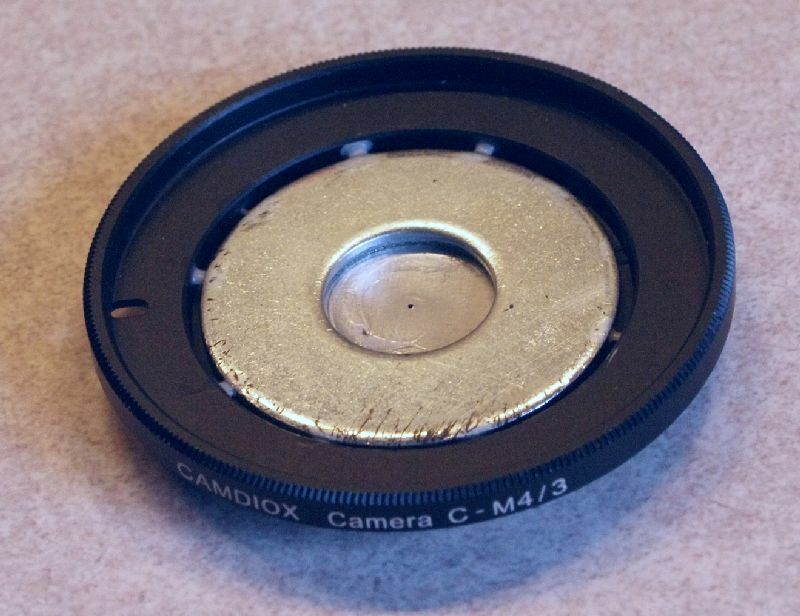 The new aperture disk is cut smaller than the washer opening and is attached atop old Mark I aperture disk using PVA glue in the same manner as the washer was attached to the C-mount adapter. The aperture can be readily centered by holding the assembly overhead and holding the disk down while applying the glue; just be sure that the neighbors aren’t watching this spectacle. The glue allows the new disk to be readily removed for replacement, which facilitates trying different aperture sizes. 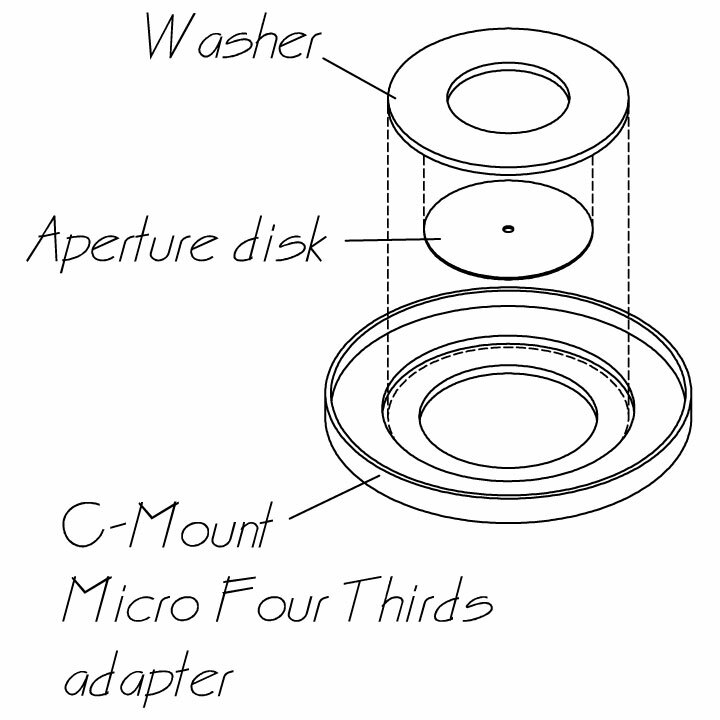 Attaching the washer to the C-mount adapter by PVA glue allows it to be removed if it is desired to use the C-mount adapter for its intended purpose, such as after finding that the image is blurry no matter what size aperture is used, due to the diffraction of light. Lens is a Celestron 500mm f/5.6 catadioptric that I bought in the late 1980’s and which has survived years of storage and little use quite well. It was fitted with a Twin Oaks 2+ solar filter which I bought on eBay for about a quarter of the price new (best not to shop in the months preceding a solar eclipse). The filter was for a slightly larger scope, so required “shimming” with some black self-adhesive felt around the inside to make a very tight fit to the lens; this is not a filter that I want accidentally falling off in use! The lens has a T-2 mount, and for photography I probably would have been better off just using my T-2 to Micro Four Thirds adapter and cropping the resulting images. However, I also wanted a large enough display on the viewscreen to show my children this wonderful event, so mounted the camera to the lens via a Konica AR T-ring, a Soligor 1.5X teleconverter, and a Fotasy Konica AR to MFT adapter. 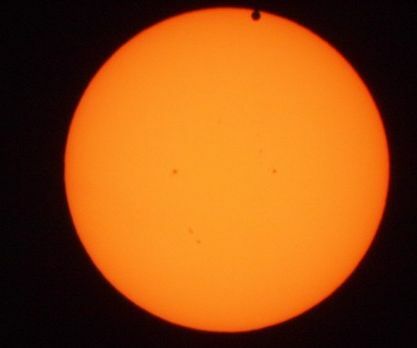 This provided a suitably large image on the viewscreen, but without the edge of the solar disk quickly drifting off screen as happens with a 2X teleconverter. 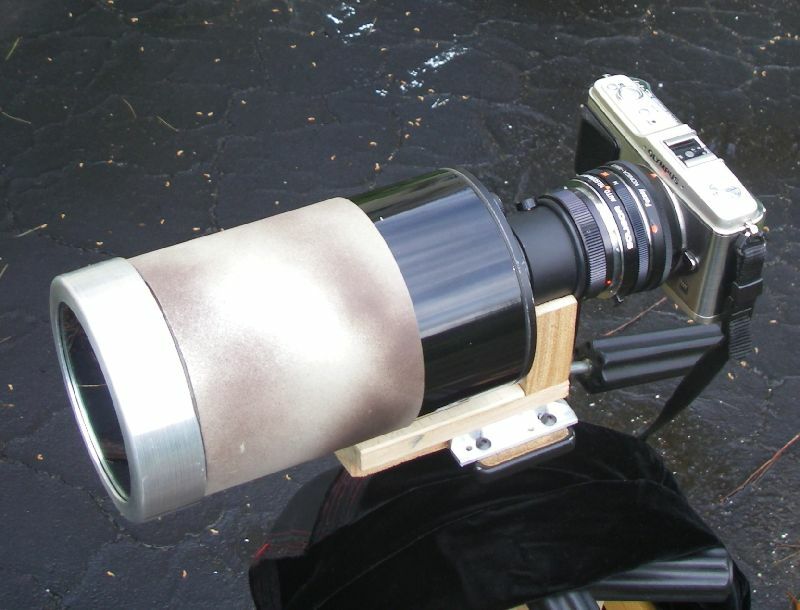 The lens has a homemade wooden block with a tripod socket mounted further back to improve the balance. The lens shade shown, a piece of dryer duct lined with self-adhesive black felt and sprayed in a camouflage finish, was not used. This contraption was mounted atop a homemade tripod that employs three discarded wooden crutches as legs, supporting a heavy Manfrotto pan-tilt head. The remaining piece of equipment was a piece of black cloth to cover the camera and duck under, in the manner of old-time photographers with view cameras. Testing when I first bought the solar filter showed that this was necessary both to see the viewscreen and to avoid accidentally looking at the sun while aiming the camera. The E-P1 allows setting two custom reset profiles, and I have set one for typical tripod shooting, with image stabilization turned off, manual focus selected, and a 2-second delay on the shutter to avoid the need for a cable release. The exposure compensation was set to provide a visually pleasing image (either -0.7 or -1.0; in the excitement, I did not take notes), and the zoom focusing option was used to get the least blurry image. I am not really happy with the image quality (of course, I selected the least fuzzy of the series to post), but the rig did provide me a viewscreen to conveniently show this relatively fast-moving event to all three children. And, having expected the forecast clouds to obscure the event completely, I was overjoyed to be able to see any of the transit. 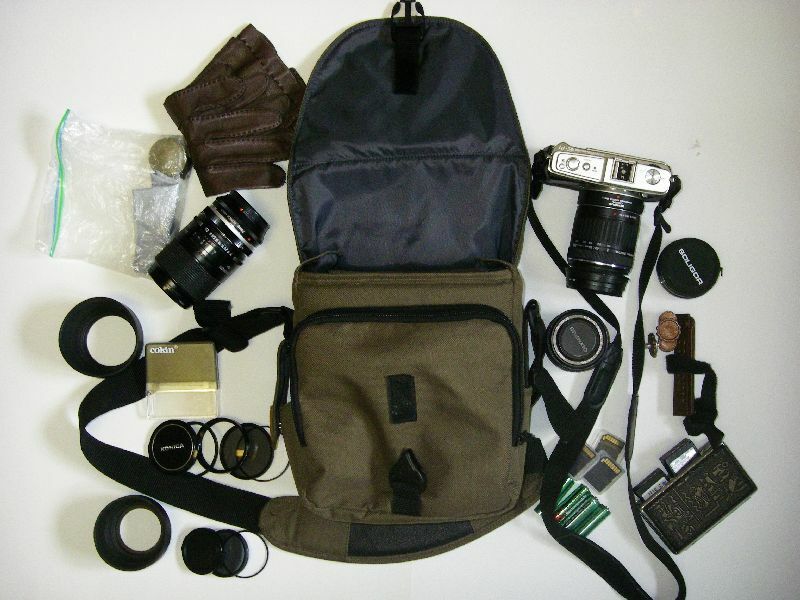 Many photographers are overly interested in equipment (sometimes seeming more interested in the gear itself than in actually using it), and a common article is the self-indulgent listing of what the particular photographer typically carries in their shooting bag. Working under the delusion that my preferences might matter to anyone other than myself, here is yet another such article. Center/top section – E-P1 with either 14-42mm micro four thirds zoom or standard four thirds 40-150mm zoom and MMF2 adapter mounted, and the other of these two lenses either at the bottom of this section, on the right side (40-150), or on the left side (14-42), depending on whether other lenses are being carried. 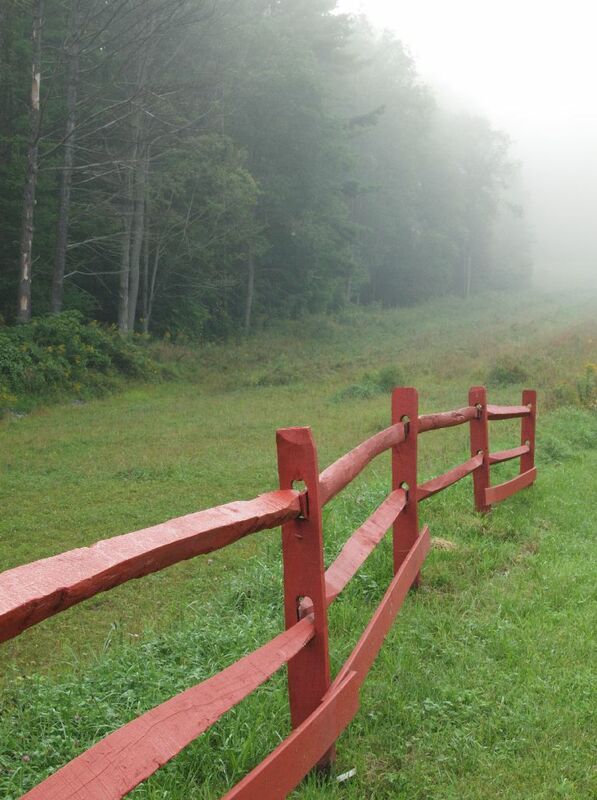 Which of the two is mounted depends on expected shooting; typically, it is the shorter-length zoom for landscapes. The camera body is in a Chinese synthetic leather half case, with the shoulder strap attached to the case and folded atop the camera when bagged. The full-sized 40-150mm was selected on the basis of being half the price of the micro four thirds version at the time, with the adapter included. For $200 saved, I can live with carrying the extra 71g mass. Since I have a collection of 55mm filters for my Konica lenses, this lens is fitted with a 58mm-55mm step down ring and 55mm pinch-center cap. Right side – Most often, nothing. Frequently, a Tamron SP 90mm/2.5 macro lens w/ Adptall 2-to-Konica AR adapter and Konica AR-to-Micro Four Thirds adapter (“Fotasy” brand, which appears to be significantly better quality than the “Pixco” brand that I first bought – note the added fluorescent index dots on the sides). This provides the effect of a 180mm macro lens in 35mm, and provides couple of stops improvement over the 40-150mm. Alternately, to give a bit longer reach than the 40-150mm, a Konica Hexanon 200mm/4 fitted with the Fotasy adapter. Konica’s 80-200mm/4.5 zoom might be a better choice, offering closer focusing distance and only slightly greater weight, but the diameter is just a bit large for the bag, making it a struggle to insert or pull out. A significantly heavier alternative is a Vivitar 200mm/3.5 lens (in Konica AR mount) I couldn’t resist for $11 shipped off eBay, which is also a bit longer and thus makes for a tight squeeze to fit the camera in on top. If I expect to shoot in very dim light w/o flash, I will substitute a Konica Hexanon 50mm/1.4. On rare evening occasions when I think it will be used, the flash (Vivitar DF-183) may replace any lens on this side. Left side – The bag has a small horizontal flap partition which I use to separate off the bottom of this side, and my seldom-used Soligor 1.5X teleconverter for Konica AR lenses (giving a dim, shaky option for an effective focal length on 600mm with one of the 200mm lenses) skulks at the bottom on this side (if carrying the 90mm Tamron lens, this may on rare occaisions be replaced with a 2X teleconverter). The space above is either empty, holds the 14-42mm MFT zoom, or holds a shorter legacy lens with a wider maximum aperture than the MFT zoom. This is most frequently a Konica Hexanon 40mm/1.8, less commonly a Tamron Adaptall 2 24mm/2.5. Either of these lenses are mounted to the Pixco Konica-to-MFT adapter, reasoning that the slightly loose fit will not be as great a concern with these shorter focal lengths. Front pocket – Two spare camera batteries carried in an Egyptian motif cigarette case from China that I found on eBay during an unrelated search. Ziplock bag containing a puffer brush (a 20+ year old model that still works far better than one that came in a more recent cleaning kit) and a microfiber lens cleaning cloth. A couple of spare SD cards in their plastic cases. 55mm collapsible rubber lens hood (this came with the first lens I ever bought, the Konica 80-200mm/4.5 zoom, and after 25+ years is still supple with no signs of cracking or brittleness). 55mm filter stack – base end is a 46mm-55mm step-up ring with a removable circle of matte board inserted into it to close it off; filters are a polarizer, a Minolta No. 1 achromatic close up diopter (which allows macrophotography with the 40-150mm zoom or whatever 200mm lens is carried), and a seldom-used UV filter for adverse conditions; during foliage season, I may also add in a red-enhancing didymium filter; top end is closed by a spare 55mm lens cap. 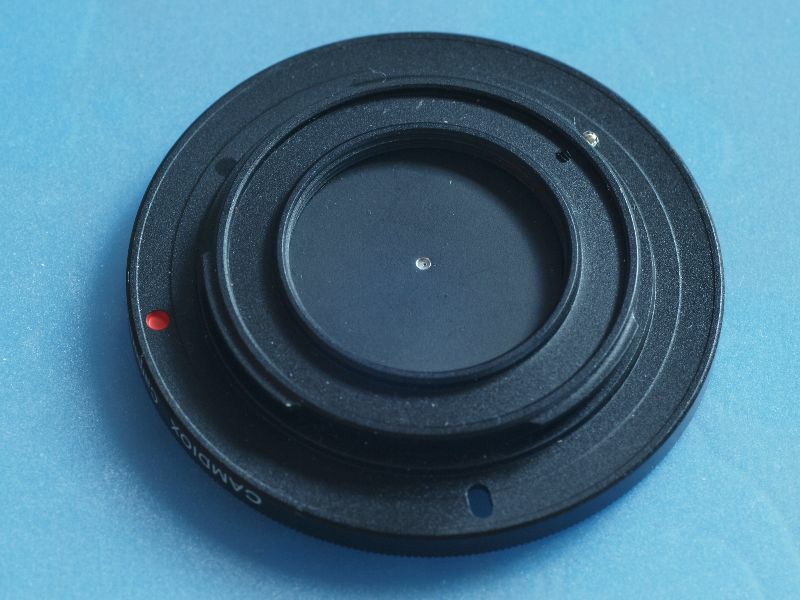 46mm filter stack for the 14-42mm zoom – base end is a 40.5mm-46mm step-up ring, closed with a removable circle of 0.02″ styrene plastic; currently, the only filter is a 46mm polarizer, and the stack is completed with a 46mm lens cap. 46mm collapsible rubber lens hood modified to allow use without straining the focusing motor of the 14-42mm zoom – the rubber hood was removed from the original clunky metal ring and glued onto a 46mm-52mm step-up ring, and then the open end was cut back about 1/4″ until I could get the lens’ autofocus to operate without complaint. Simply shading the lens with my left hand is often more convenient, as using the hood requires removing the step-up ring from the 46mm stack. Ultra-Pod – a light table-top ball-joint tripod that is just barely able to support the E-P1 with smaller lenses, sprayed in Krylon’s “hammered copper” Fusion paint to try and give it a more “steampunk” look. Likely to be replaced with the larger Ultra-Pod II some day. Grad ND filter – Typically a Cokin A121, sometimes a Cokin P121M. Either is typically handheld, rather than using a holder to mount it on the lens. This can alternately be carried in a zipper pocket formed in the top flap (as can the cleaning kit). Spare AA batteries. Top flap pocket – Thin leather gloves. 1 gallon plastic food storage bag and a coule of rubber bands (not shown). Side cell phone /MP3 player /GPS pocket – Unused. Side flat pocket – Unused. Back flat zipper pocket – Unused. Just because the manufacturer adds a pocket does not create any obligation to find something to put in it. Wednesday evening, Claremont was treated to a spectacular thunderstorm with multiple cloud-to-ground strikes. Having seen the storm approaching while grocery shopping with my son, I hurried to mount my camera onto a tripod and set it up on the covered porch in hopes of capturing one of these strikes. The E-P1 allows the operator to set a couple of profiles, so with just a few button pushes I can set it to a tripod-mount profile with a 2-second shutter delay, manual focus, the sensitivity set at the base ISO 200, and the image stabilization turned off. 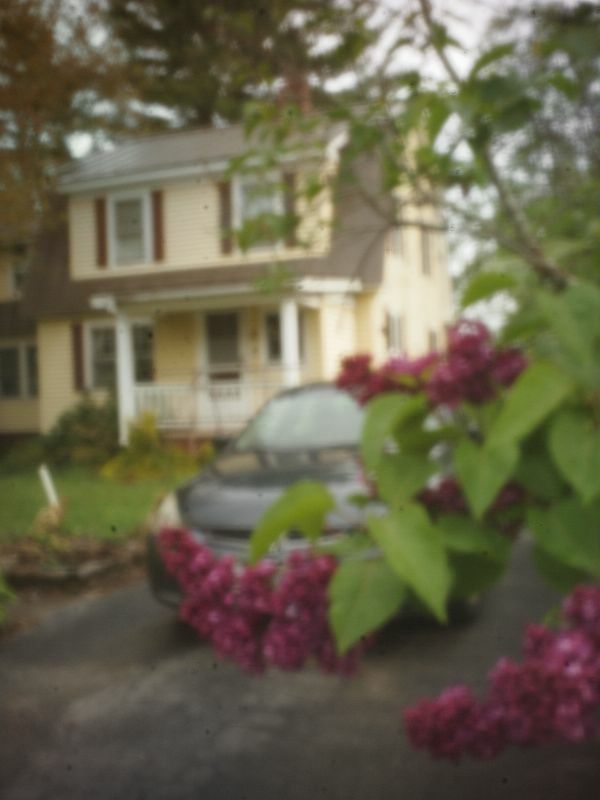 To prolong the shutter time, I set the aperture at f/16, resulting in shutter times of a few seconds. With more time, it would have been helpful to turn off the noise reduction feature that automatically subtracts a dark frame for shutter speeds over 2 seconds to remove noise due to hot pixels. A nice view looking over the driveway and the neighbors houses was composed as wide as I could get it without the roof or porch column intruding, but set back under the roof to protect the camera. The image looked a bit bright, so I set the exposure compensation down 1/3 EV and happily shot away until heavier downpour and wind gusts motivate me to move the camera inside. At this point, sharp-eyed readers (note the blithely optimistic belief in the existence of multiple readers) may note the lack of any accompanying lightning-bolt photo. The visible bolts appeared to strike just after the shutter closed and/or just during the 2-second self-timer delay. While several of the shots showed a significantly whiter image of the driveway and garage, indicating at least one flash of lightning during the exposure, not one showed any discernible bolt. None of the photos of cloudy skies over my driveway, garage, and the neighbors’ houses were of sufficient visual appeal to merit saving, much less presenting. This would have been a disappointing experience if it hadn’t served as motivation to spend time out on the porch with my son, watching the storm. Perhaps next time I’ll get that shot. 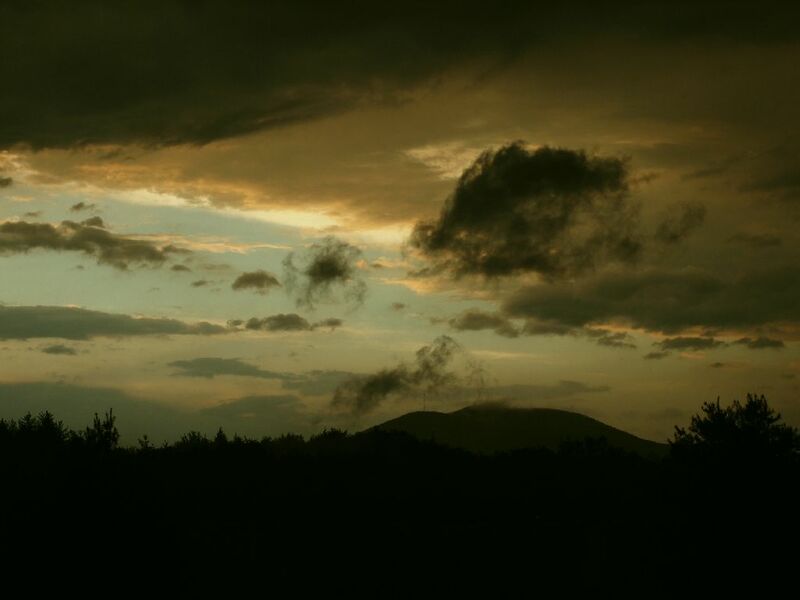 Mount Ascutney, just after storm passed (on the way to picking up daughters from 4-H meeting). Rain can be discouraging. Even though most photographers know that bright sun is technically poor lighting for most purposes, sunny weather inspires one to get out and enjoy the day, while rain typically motivates one to find something of interest indoors. Even with a water-resistant camera, it is sometimes hard to muster enthusiasm when the weather is wet and grey. 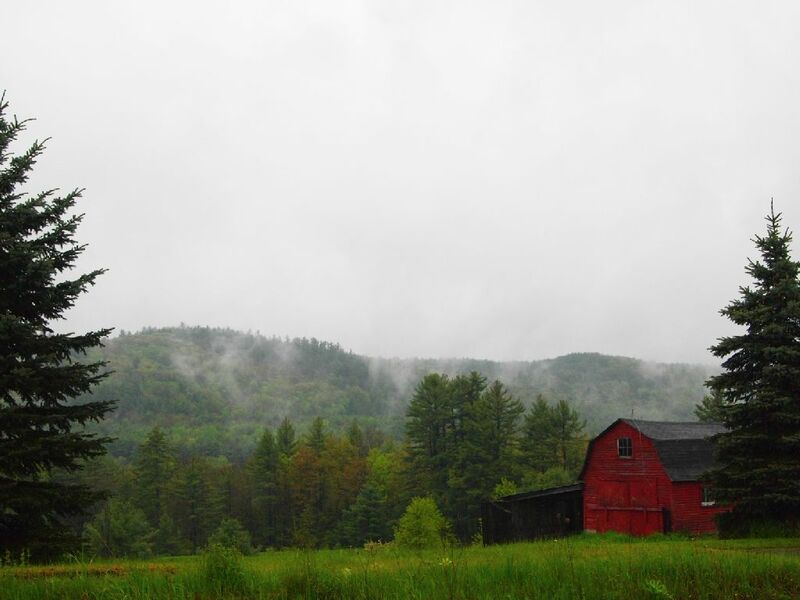 Torrential downpours are not particularly photogenic, but light rain and drizzle can often create lovely mist effects for landscapes. Lacking a water-resistant camera, a home-made rain cover (such as shown last entry) can be employed to keep the fiddly electronics dry. Additional shooting opportunities occur just before or after the actual rainfall. 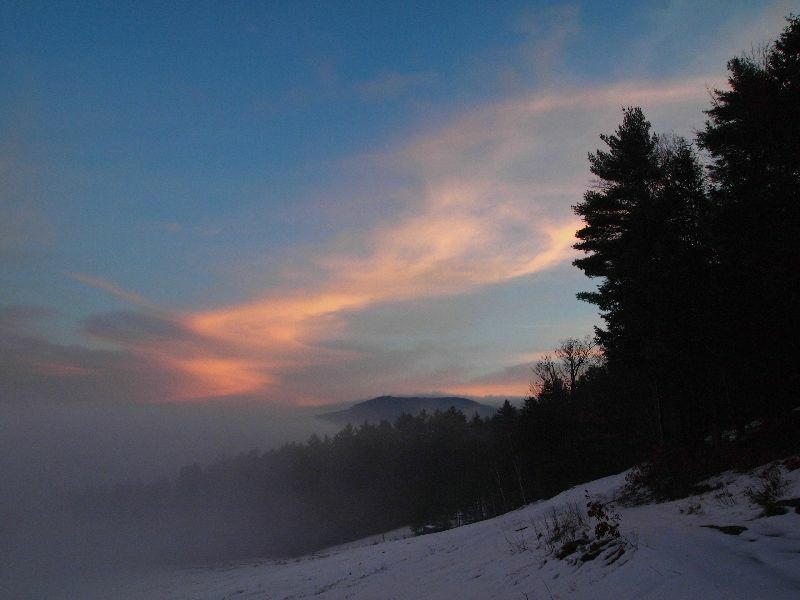 The interplay of clouds and light can create dramatic lighting effects which typically appear and disappear quickly. 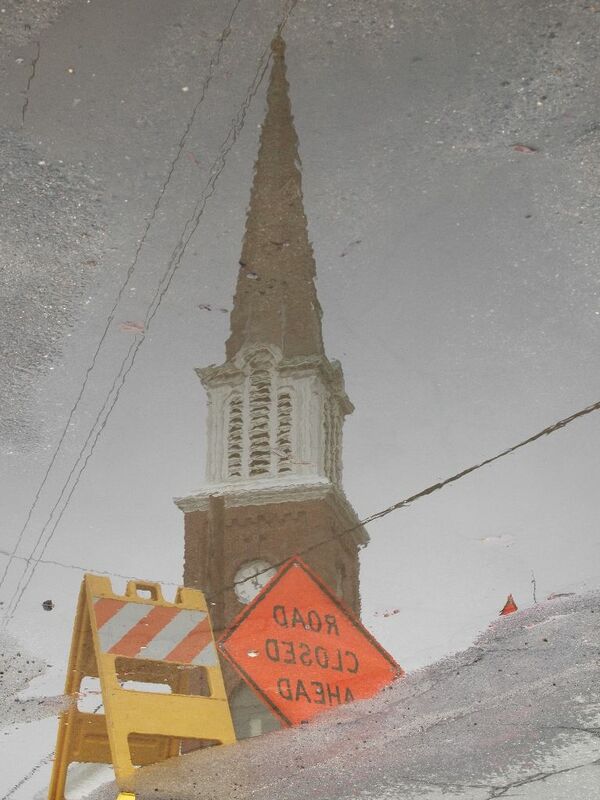 Reflections in puddles offer the option of creative framing to show only a selected portion of the mirrored world. The rain has to end eventually, so it is good to have a camera on hand, ready to shoot when it does. 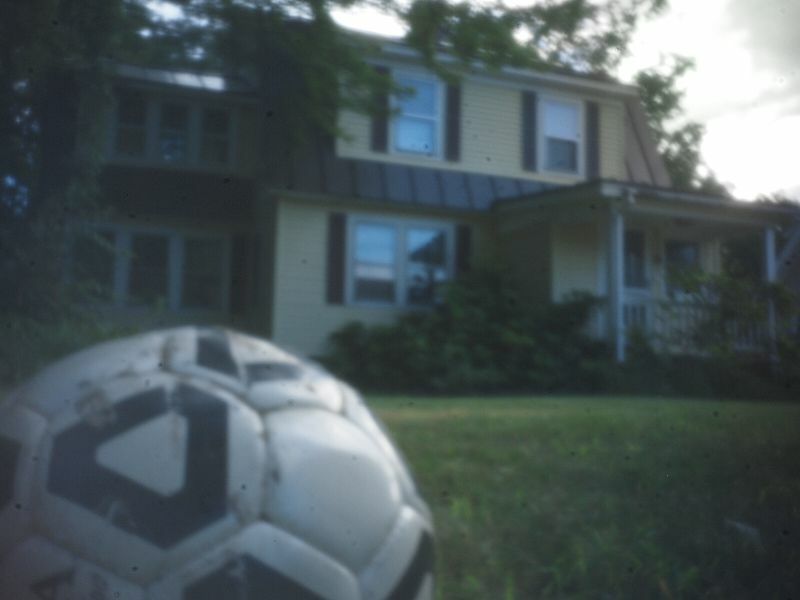 The E-P1 kit zoom is the first generation Olympus 14-42mm Micro Four Thirds zoom, which does not handle filters well. The terminal element rotates as the lens focuses, and the petite focusing motor is not happy when torque is applied to the filter threads. Even rotating a 46mm polarizer needs to be done gently to avoid an irritating and cryptic “Please check the status of a lens” message on the viewscreen. (Reportedly, the 2nd generation 14-42mm has internal focusing and avoids this problem.) Clearly, there was no way that the little focusing motor could handle a Cokin A holder and a graduated ND filter for shooting landscapes with the lens at its wide angle setting. The simplest solution appeared to be to form a bracket to position an empty filter ring around the end of the lens when in its extended wide-angle position (a peculiarity of the lens is that it is shortest in the middle of its zoom range, extending out as it goes either towards the wide angle or telephoto end.) 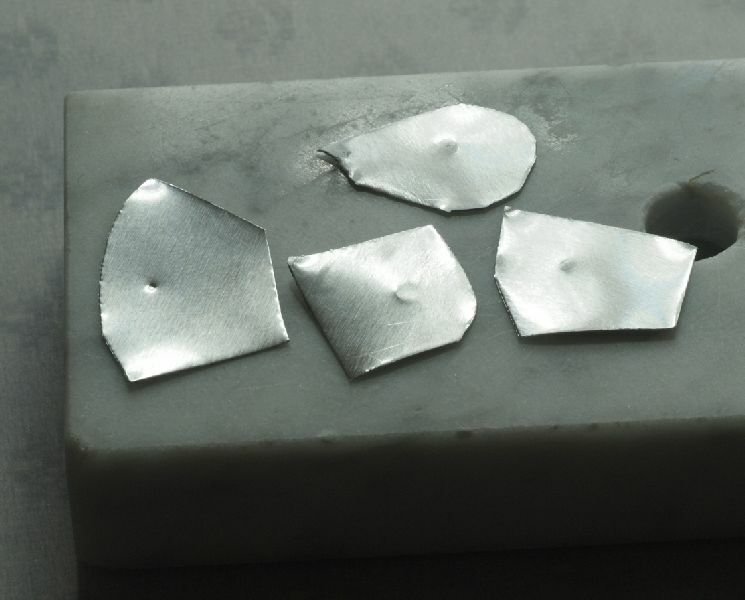 Accordingly, an L-shaped piece of scrap aluminum was cut to rough size from a salvaged piece of electronic equipment. Measuring the desired setback of the camera body with the lens extended, a 1/4″ hole was drilled for a screw to attach the bracket onto the base of the camera via the tripod mounting socket. Note that this screw should have a threaded recess itself to allow the entire ungainly assembly to still be tripod-mounted. Thin cork gasket material was attached to the top surface of the aluminum with double-sided tape. The camera was then secured into place, the lens extended and an empty 55mm filter ring placed roughly concentric with the end of the lens. 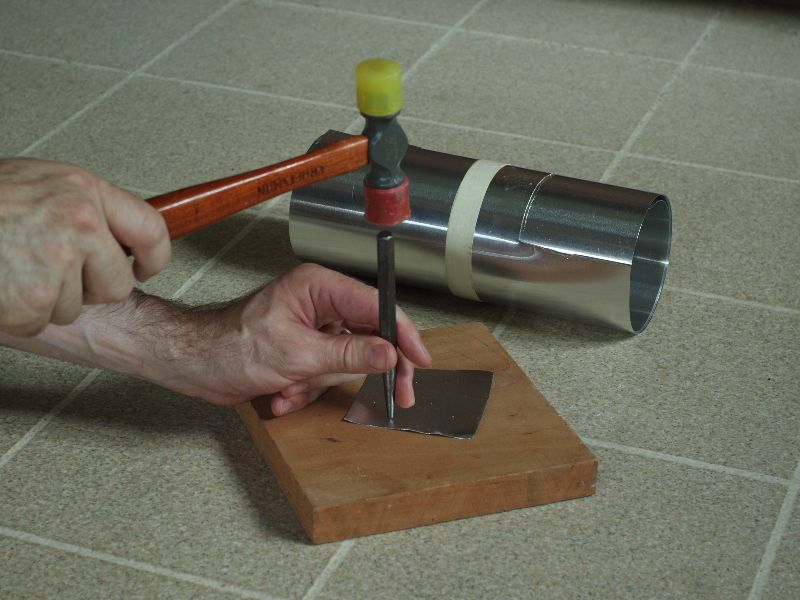 The filter ring was traced, this outline used as a guide to cut a curve in the aluminum, and the ring attached in place with epoxy. A second scrap filter ring was added; this second ring not only provided additional surface area for the epoxy bond, but also extends back over the end of the lens to provide some shading, particularly when the lens is retracted in its middle range. 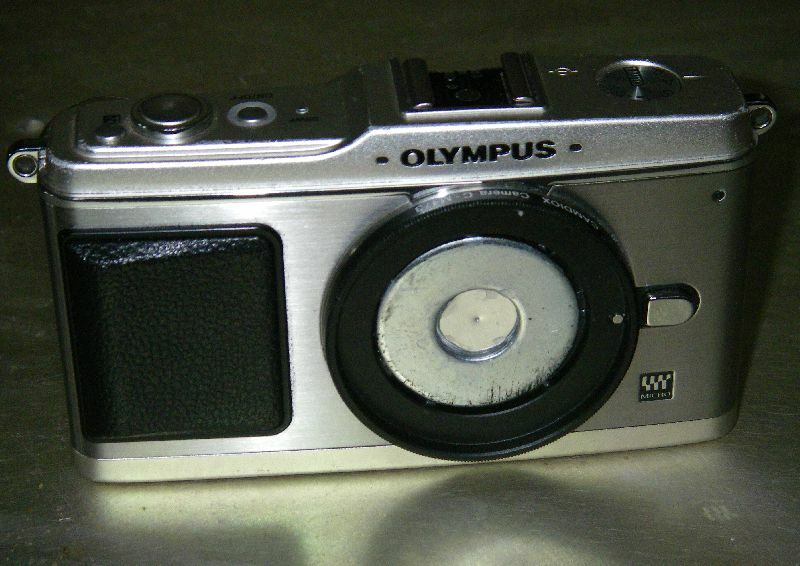 The back of the aluminum was eventually cut so as not to protrude behind the camera as it does in these early views. Now, any filter system that can adapt to a 55mm thread can be attached, without straining the delicate focus motor of the lens. This piece of gear, along with a Cokin A holder and 55mm mounting ring, was dutifully stowed away in the center console of my automobile ready for use in my travels. In practice, I hardly ever pull out this clunker, and instead simply hold a grad ND filter by hand in front of the lens. This does require a good bit of care to avoid reflections when there is light striking the camera from behind. Happily, I found that this rig is well suited for shooting in rain and snow (without a filter). For this use, a 1-gallon plastic bag with one corner cut off is forced over the marrow section os a telescoping rubber 55mm lens hood, and the hood is then screwed onto the ring on the bracket. The bag covers the camera, with access for the hands from below, and the hood extends to shield the lens from precipitation. While my children were enjoying their last day off in Florida, I made another optimistic trudge up the local hill in hopes of capturing dramatic morning light breaking over downtown Claremont. Particularly in the Winter, there often seems to be a brief window of lovely golden light just at sunrise, fading after five or ten minutes when the sun becomes obscured behind clouds (this frequent gap between the horizon and the clouds appears to be proof that the clouds prefer Claremont, while towns to the East enjoy prolonged morning sunshine). I hoped to capture this warm glow illuminating the downtown. Sadly, the clouds and sun did not cooperate, and the lighting was pretty dismal. At least the poor lighting made me less disappointed to find that, in my last minute decision to throw my hefty 500mm/5.6 mirror lens into my pack, I neglected to include an adapter to mount it to the E-P1. My last trip up Flatrock Hill was back in November, on a misty Sunday morning when I hoped to capture taller buildings such as the smokestack and clock tower protruding from the mist as it burned off. The mist failed to cooperate, and I gave up after noting that it was rising as the mornign wore on. I did manage to get some dramatic clouds on the climb up and some soft, pastel-colored images of Mt. 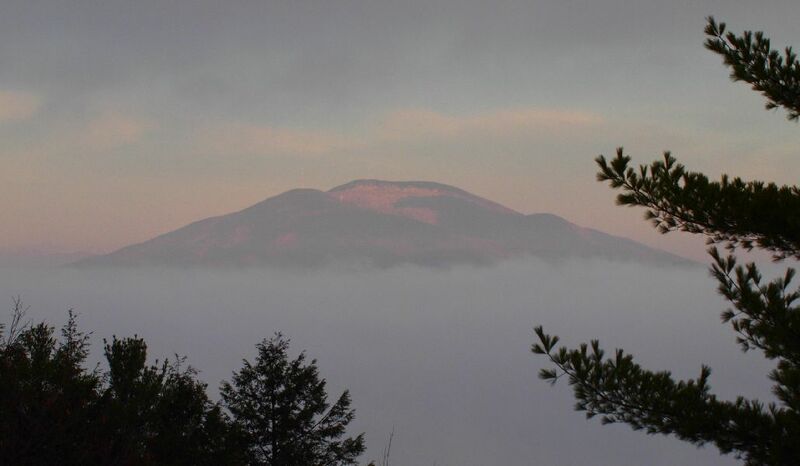 Ascutney rising above the mist before it thickened too much. I wonder what will await me on the next attempt.